As in his novels and essays, Wiesel weights his approach to Judaic destiny and the holocaust he survived, as testimony, but here in these affectionate clusters of Hasidic tales and legends of his childhood, he further reaches toward new generations as one who "transmits. . . to close gaps and create bonds." 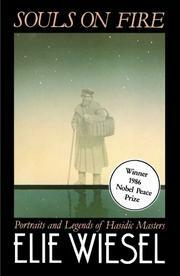 The mystic Hasidic movement, which ran counter to a more formalized, academic Judaism in the East Europe of the 18th century was conceived (or so it is popularly believed) by "the Baal Shem," a hazy figure to historians but to the Hasidim a fountainhead "where facts became subservient to imagination and beauty." ("If it is true, as the Baal-Shem says, for man to hide the light of dawn. . . simply by shielding his eyes with his hands. . . he can rediscover it by merely moving his hands.") The second group of tales concern the great Maggid and his school at Mezeritch about which it was said that, whereas ali men can say God exists and is of this world, at "Mezeritch they know it." It was the Maggid who adapted the concepts of Baal Shem through the new idea of the office of the Rebbe, who offered almost supernatural powers as well as wisdom, who spoke for God and interceded for man. There are tales of marvelous appearances and even denunciations of God for broken promises (possible when God was so close, so bound in love). Throughout the tales of other great Masters Wiesel reenters a dazzling world of religious certainties and "everything is possible." A revivifying collection.